Lansing Urgent Care is a participating provider with many insurance plans including BCBS, SPHN, PHP, TRICARE, Aetna, Cofinity, IHP, Medicaid and many others. In the rare event that we do not participate directly with your insurance plan, we can submit your claim directly to your US based insurance company on your behalf. What is a facility fee? Does Lansing Urgent Care charge a facility fee? A facility fee is a fee that many hospital-based urgent cares charge patients and insurance companies for their services. Lansing Urgent Care does not charge any type of facility fee. What do I need to bring with me when I come to Lansing Urgent Care? What are your payment policies and what payment methods do you accept? When is Lansing Urgent Care not right for me? If you feel that your condition is life-threatening you need to be seen in the Emergency Room as soon as possible. Please see our services page for more details about what we can and can not treat. Do I need to make an appointment to come to Lansing Urgent Care? No appointment necessary! We are a walk-in clinic which allows our patients to be seen at their convenience. You may also Check-In Online. What are your hours? Are you open holidays? We re-open at 6am at Clippert on 12/26 and all other clinics at 9am (normal hours from there on out). ** On Thanksgiving, Nov 22nd our Frandor Location will be open from 9am-3pm. This location will re-open at 12:01am on Friday November 23rd. In order to allow all of our staff to spend holidays with their family, we are closed on Christmas. 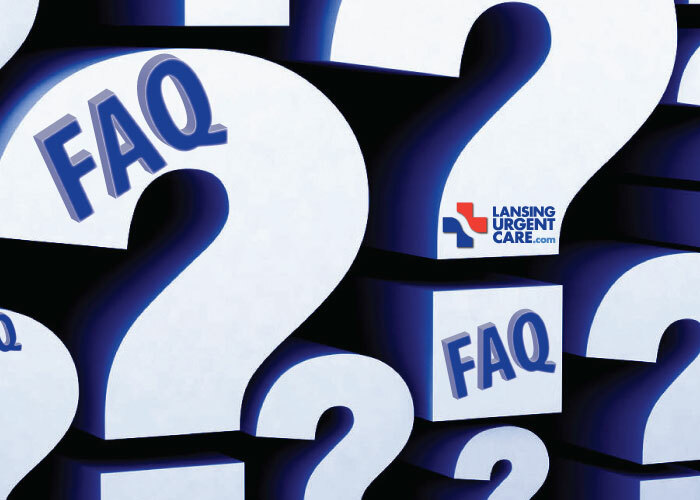 What are the typical wait times at Lansing Urgent Care? An average visit time at Lansing Urgent Care is less than one hour, door-to-door. We staff our facilities based on patient volumes to ensure our patients receive efficient care. I have a question about my bill, who should I call? For billing questions, please call our billing department at (517)-333-5271. Does Lansing Urgent Care Perform Physicals? Yes! At Lansing Urgent Care we offer MHSAA Physicals ($25ea), pre-employment physicals ($42ea), DOT physicals ($79ea), and other physicals required by state programs and college/university programs. For any other physical form, we will review the form to determine if we are able to complete the physical prior to the completion of the physical. Any physical forms requiring Lansing Urgent Care to attest to someone’s mental health status or mental health history will not be performed at Lansing Urgent Care. Please contact your primary care physician for completion of those physicals requesting attestation of mental health status or mental health history. Annual health physicals covered by insurance are not performed at Lansing Urgent Care, please see your primary care physician for completion of these annual physicals.